Vampire Beauties: Vampiress Review: "Van Helsing"
The Gist: A monster hunter is sent by the catholic church to find out and destroy a group of monsters that are ravaging a Transylvanian town. Clarification: Every night Dracula's Brides come down from the castle and kidnap select people from the town below. 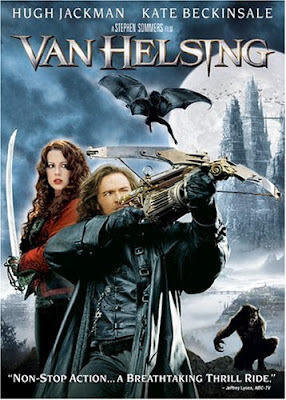 Once Van Helsing comes to down and interrupts that, he becomes hated by the townspeople (who now believe with good reason that Dracula will want revenge) and a marked man from Dracula himself who is using Dr. Frankenstein's research to try to create an army of vampires. Female Vampire Factor: This Film gets a Vampire Beauty Rating of 5 out of 5. Outside of Wes Cravens "Dracula 2000" this is the only time the Brides have had their own individual personalities and aren't just random fanged chicks in one scene. Also the Brides are treated as Dracula's equals by him which is also a rarity. As mentioned above the brides in this film actually have individual personalities which is one of the first things that is noticeable. "Verona" (Colloca/raven hair) is the most mature of the three and keeps the other two in check, Aleera (Anaya/red hair) is the most sadistic of the three which seems to have it's roots to her former human life and Marishka (Maran/blonde) is the one who seems to act very young thus very flirty and careless.